Spangdahlem Air Base (AB), Germany, home of the present-day 52nd Fighter Wing (FW), has been a steadfast military presence in the Eifel Mountain region of Germany for over four decades. Its diverse history actually began shortly after the end of World War II. Spangdahlem Air Force Base is located in southwestern Germany near the border of Luxembourg. Over six million visitors come to this region each year to enjoy the history, nature, and scenic views of the area. Trier, the oldest city in Germany, is twenty minutes from Spangdahlem. The Mosel River, with its picturesque villages and famous wines, flows nearby. Contrary to popular belief, the installation was not used by the German Luftwaffe during the Second World War. Nor was it ever occupied by units of the French Air Force. Most of the construction work took place between 1951 and 1953 at a cost of roughly $27,000,000. French and German contractors, working under the supervision of a French government agency, completed the majority of construction. The French were directly involved for two reasons--the base was located in the French Occupation Zone and construction costs were paid for from Occupation Funds (reparation costs paid to the Allies by Germany after the end of World War II). For these same reasons, the French also designed and contracted the construction of several other air bases located in this portion of Germany including Bitburg, Ramstein, and Hahn. 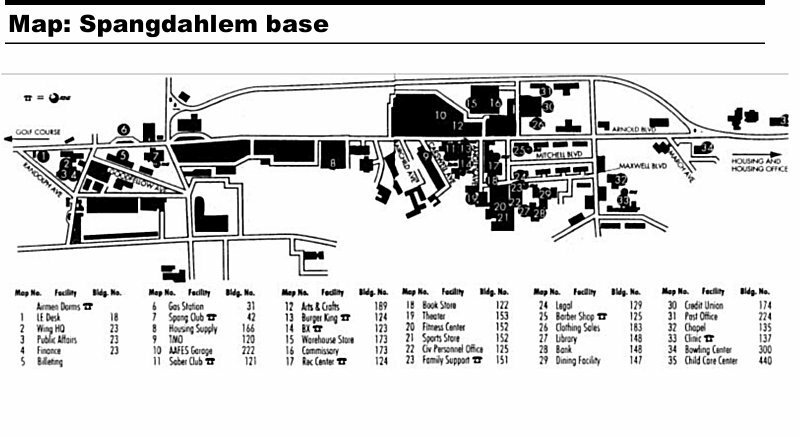 Several wings have occupied Spangdahlem AB over the past 46 years. The initial military presence began on 1 September 1952 with the arrival of US Air Force (USAF) elements from Fuerstenfeldbruck AB near Munich, Germany. The base was officially dedicated nine months later, on 10 May 1953, and became the new home of the 10th Tactical Reconnaissance Wing (TRW). The wing moved to Spangdahlem AB from Toul-Rosieres AB, France. The base population at this time totaled slightly more than 1,900 personnel. Upon its arrival at Spangdahlem AB, the 10 TRW operated RF-80A Shooting Star and RB-26C Invader airplanes. In October 1954, the wing received RF-57 Canberras and then acquired RF-84 Thunderjets in July 1955. The unit received RB-66 Destroyer airplanes in November 1956 and WB-66 Destroyer aircraft one year later. In early August 1959, the 10 TRW ended its six-year stay in the Eifel and moved to RAF Alconbury, United Kingdom. Later that same month, the 49th Tactical Fighter Wing (TFW) moved to Spangdahlem AB from Etain-Rouvres AB, France, and assumed host unit duties. The 49 TFW flew F-100 Super Sabre fighter-bombers until 1961 when it converted to F-105 Thunderchief aircraft. On 9 March 1967, the unit began receiving F-4D Phantom II airplanes. The 49 TFW remained at Spangdahlem AB until 1 July 1968 when it relocated to Holloman Air Force Base (AFB), New Mexico, to serve as the US Air Force's first dual-based, NATO-committed wing. Meanwhile, the 7149 TFW was activated at the base on 1 July 1968 and served as a caretaker unit for a number of support organizations that remained behind after the departure of the 49 TFW. Although it did not have any assigned aircraft, the 7149 TFW would have served as a nucleus on which to build if the 49 TFW had been ordered to return to Europe to bolster NATO air forces. On 1 January 1969, the 36 TFW, located at nearby Bitburg AB, assumed operational control of Spangdahlem AB as well. Aircraft based here at the time included the F-4D Phantom II and EB-66 Destroyers. The 52 TFW was activated at Spangdahlem AB on the final day of 1971 and has served as the host unit for over 25 years. During this time, Spangdahlem AB became one of a select few USAF installations to host all four major versions of the venerable F-4 Phantom II fighter--C, D, E, and G models. The first F-16C Fighting Falcon arrived at the base in April 1987. On 1 October 1991, the 52 TFW was redesignated the 52d Fighter Wing as part of a sweeping, Air Force-wide restructure. One year later, in October 1992, Spangdahlem AB welcomed its first A-10A Thunderbolt II fighter. In the spring of 1994, the 53rd Fighter Squadron relocated to Spangdahlem from Bitburg-bringing with them their F-15C/Ds. By October 1995, the 606th Air Control Squadron completed its move from Bitburg AB to Spangdahlem AB. 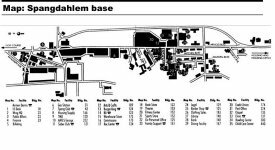 Spangdahlem AB currently includes about 1,282 acres of land (two square miles), a 10,000-foot primary runway, an 8,074-foot secondary runway, and over 500 buildings. The base (along with Bitburg Annex) is now home to approximately 5,000 US active- duty military members and 7,000 dependents-all of which are valued members of "Team Eifel." In March 2003 the 148-foot wide primary runway was closed for improvements. Pilots began landing on the taxiway which is half as wide and a slight rise on the approach end causing aircraft to touch down sooner than expected. The primary runway will be closed until September 2003 as the drainage for that runway is improved. The runway improvements are having a negative effect on flight operations as takeoffs and landings are down from 90 to 35 or 40, though this figure is somewhat suspect as most of the bases aircraft were deployed to the Middle East at the time. Night operations have been suspended and cargo aircraft are not using the base. Renovations and upgrades to the primary Air Port of Embarkation [APOE] in Central Region (Ramstein Air Base) are complete and the facilities fully meet the needs of deploying Army forces. An alternate APOE in Central Region has been identified and established in the eastern division's sector and has been upgraded to meet the most significant needs of deploying Army forces. A DPC has been established there. Spangdahlem AB lies in the southwestern portion of the country in the German Land or state of Rhineland-Palatinate (called Rhineland-Pfalz in German)--not far from the borders of Belgium, Luxembourg, and France. Specifically, Spangdahlem AB is located in the Eifel, a region of rolling hills and valleys created by ancient volcanic craters. Formed in 1946 from Bavarian, Hessian, and Prussian lands which previously had never belonged together, Rhineland-Palatinate encompassed more than 20,000 square kilometers with a population of almost 4,000,000 people. Initially one of the poorer regions, it is today the state with the largest export quota and serves as headquarters for Europe's largest chemical corporation, BASF. Although one of the smaller German States, the region also contains more than two-thirds of all the vineyards in the Federal Republic. The most famous of these is found along the Mosel River between the cities of Koblenz and Trier. The Mosel zigzags between the hills of the Eifel, through a peaceful landscape of scenic forests, gentle streams, quaint villages and picturesque lakes. Although a quiet, rural area, the Eifel region has one of the most colorful histories of any section of Europe. Over the past 2,000 years, the Eifel has been under the control of , besieged by, or belonged to the Gauls, the Romans, the Prince of Lothringen, the Count of Luxembourg, the Kingdom of Burgundy, King of Spain, Austria, the Netherlands, Sweden, France, Prussia, and a host of various German governments. Trier, the principal city on the Mosel River, is the oldest city in Germany, established in 16 BC as the administrative capital of the Roman Empire's northern region. Nearby towns such as Speicher, Quint, Dezem, Ehrang, and Wittlich are also former Roman settlements. The climate is generally cool. Light rain and fog are common. The temperature in winter stays close to freezing, while summer temperatures hover between the 60s and upper 70s. The average annual precipitation is about 27 inches, and approximately 12 inches of snow blanket the base each year. Usually people compare the Eifel's climate to the western part of Washington state. Fog and low cloud ceilings, especially in the winter, can make driving hazardous. This part of Germany gets an average of 100 days of sunshine per year.